Following the success of Reggaefest 2010 at the Byron Bay Brewery, Spring 2011 will see the festival return to the area on September 17 & 18 at our stunning new outdoor location where the river meets the sea, 25 minutes south of Byron Bay. Meters from the river and minutes from surf beaches, for two days Missingham Park will be home to some of the biggest national and international talent in Reggae, Dancehall, Dub and Roots music. Reggaefest will feature an open-air marketplace that will offer a selection of local craft items and clothing as well as health conscious food with international flavors. As an all ages event, a supervised kid-friendly zone with activities throughout the day makes it perfect for families. The massive line-up is yet to be announced but rest assured Reggaefest is preparing a quality experience. 2011 website will be accessible from April 1st with Early Bird ticket specials and how you can get involved. In the meantime feel free to sign up to the mailing list on www.reggaefest.com.au for all the latest news direct to your inbox. 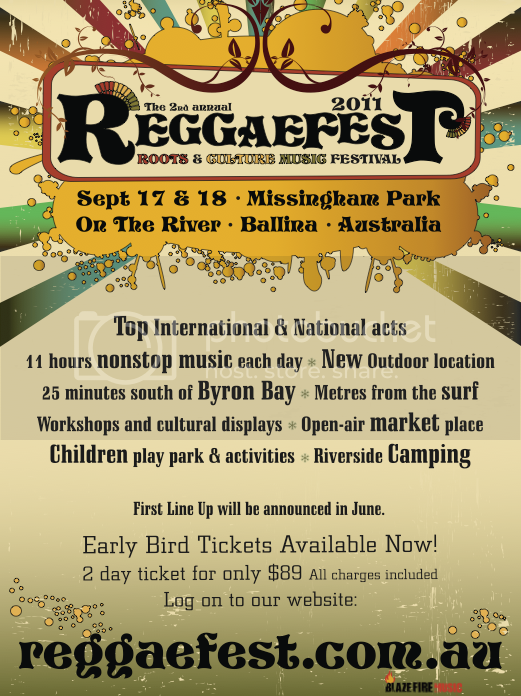 Reggaefest 2011 – Roots and Culture Music Festival, 17 & 18 September, Missingham Park, Ballina. Reggaefest 2011 – Two massive days of live music, activities and culture! Reggaefest will be welcoming in Spring 2011 at their stunning new waterfront location, 25 minutes south of Byron Bay. Top international, national and local artists will be providing eleven hours of non-stop music each day. First line-up announcement includes: Nkulee Dube, South African princess of ethno ragga/soul and daughter of the late great Lucky Dube; Jamaican heavyweight chanter Jah Mason; New Caledonian Ragga-Dancehall group NeaCombo Diffuzion; fresh from Glastonbury Festival, Melbourne’s own Mista Savona and Vida Sunshyne; recent Triple J’s Unearthed winners Kingfisha; crossing the Tasman for her second appearance at Reggaefest, Silva Emcee; local rising stars Blackbirds and The Grains, Melbourne’s LubDub and Simon Wright; national artists Darky Roots, Paua, Raz Bin Sam & Lion I, Cheap Fakes, One Dread and more international and national artists to be announced. The festival will feature an open-air market place offering local craft and health-conscious food with international flavours as well as a dedicated area for children with a shaded play-park, face painting, craft and activities. Join in one of the many workshops, such as Jamaican Dancehall, African Dance, Indigenous Dance or Brazilian Capoeira, take part in the dominoes tournament or kick back and relax in one of the hammocks or private gazebos and watch a display from Lismore Lantern Parade light up the night. Reggaefest 2011 is about the music, the culture and bringing the community together to create a unique experience. 2 Day Early Bird tickets are on sale now for just $89 and ticket specials are also available for children and families. Visit www.reggaefest.com.au for full first line up release and more details. The full lineup for Reggaefest 2011 has just been announced and the Early Bird specials are set to finish on August 15. Over September 17 & 18 two stages will offer twenty-two hours of roots, reggae, dub, soul and dancehall music. There’ll be arts and cultural workshops from around the world, a vibrant marketplace serving up global cuisine, kids’ entertainment during the day and you can cozy up in the outdoor cinema after dark. From the legendary era of ska and rocksteady and exclusive to Reggaefest 2011, reggae pioneer STRANGER COLE (Jamaica); established hip hop, reggae and drum ‘n’ bass artist DEADLY HUNTA (UK), and actor (who you may recognize from the cult classic ‘Human Traffic’), will also be coming exclusive to Reggaefest 2011; from Bulwai Country in Kuranda, ZENNITH have quickly risen to the top of the Australian roots and Indigenous music scene with their blend of hip hop, reggae rhythms and traditional music; Australia’s king of wild and wonderful beats, SPOONBILL will captivate the dancefloor with dubstep, glitch-hop, IDM, breaks, psychedelic electronica, folktronica, trip-hop and more; OKI AINU DUB BAND (Japan) fuse dub, reggae, African rhythms and electronica with Ainu folk melodies and traditional instruments; Salmonella Dub singer MIGHTY ASTERIX (NZ) will be bringing some sweet NZ melodies to Reggaefest 2011; Sydney’s Afro/reggae/hip hop ten-piece, THE STRIDES are being heralded as Australia’s equivalent of Fat Freddy’s Drop; locals CBD DUB PROJECT will be performing as a trio; Australia’s premier female reggae selecta, SISTA ITATIONS will be heading up from Melbourne; KING KRAZY & BLAZE FIRE SOUND MASH UP gathers singers from all different acts for an all-star jam, soundsystem style; and DOLLAMIX (NZ), COMRADE DUBS, BEATDUSTA, BELLYAS and BASMATI will be spinning their rare record collections, including everything from classics to the newest sounds from around the world. Jah Mason (Jamaica), NeaCombo DiffuZion (New Caledonia), King Tide (Syd), Mista Savona featuring Vida Sunshyne (Melb), Darky Roots, Kingfisha, Paua, Blackbirds, Raz Bin Sam & The Lion I Band, Israel Starr & Newtown Sound (NZ), Hayden Hack INfusion, One Dread, Cheap Fakes, LubDub (Melb), Silva Emcee (NZ), The Grains, Simon Wright, Selecta Ras George (Zimbabwe), Ghettafunkt. Until August 15 two-day Early Bird Tix are just $89, kids (6-14) are $24 for the two days or you can grab a Family Early Bird Special and pay $199 for two adults and two kids (6-14). 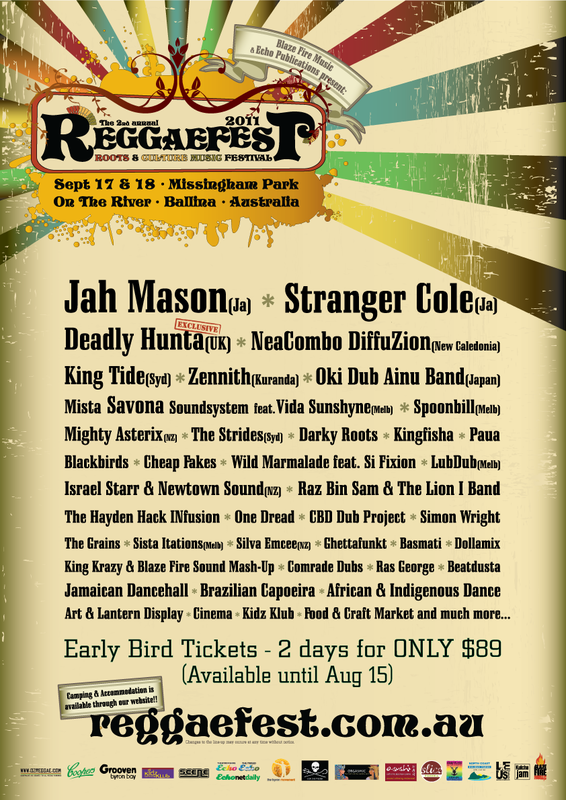 For more info or to purchase tickets, visit www.reggaefest.com.au. Nkulee Dube cancelled her Australian tour, so will not be reaching Reggaefest. Not long now! Who's got their tickets booked? I bet this guy will be there and this guy this guy forsure .But not of this is around See There. BUMP! Right thread this time. 2 days to go!! Hua,you are indeed a gracious and humble man.The world would indeed be a much better place [Ozreggae included] if more people had your grace.Loved everything about the festival.Reggae music was a big winner.And as someone said I think it was my old Rastawooki mate Eric [a talent there as well] he said"Reggaefest" made Ballina cool.Now that's saying something. Yes big up Raz, Dave and crew for this one, as well as all the wicked, wicked acts that performed. Deadly Hunter was the star of the show as far as I'm concerned - seriously impressed and can't wait til he comes back again! Have to big up Krazy Dave for his skills backing up Deadly Hunter and Jah Mason too, job well done. Highly recommend to EVERYONE that didn't make it this year to mark it in your calendar for next year.